Here is the report from my latest trip to India and Uganda; both these visits were just an amazing outpouring of God’s love to His children. When sharing some of the fruit from the ministry in the orphanage in India this year with friends, their email reply was “Wow, I am lost for words”. I think that perfectly describes this visit. This year we introduced a series of seminars for a handpicked group of older children whose rejection problems were beginning to manifest in occasional aggressive behaviour. We started with eleven and ended up with fourteen, the number was brilliant for me as I could be involved personally with each one’s needs. The first seminar I highlighted six ways rejection comes in which included physical violence in their birth homes and everyone responded for all six points. All but three were very responsive as I prayed for them, (those three in later seminars came to that same place). Three others were slain in the spirit which these children have never seen happen in their lives and is not something that happens very much in my meetings these days either so this really was God at work. Seminar two reminded me of Andrew in the Bible who having met Jesus went and fetched his brother to come meet the Saviour he had found. One boy came then went and fetched his two best friends saying this is what was taught, as they heard they recognised those needs in their lives and came and joined us. As Samuel the home leader put it, you can’t reject someone from a rejection seminar. Everyone showed tremendous trust in us and opened up their inner most secrets which with the kind of start in life they have had was surely a work of the Holy Spirit. One of the points included suffering from sexual abuse and several boys and girls responded for this and being in the small situation they could be properly ministered to. As I prayed for them almost all were slain in the Spirit and they were out for over forty minutes. I felt I had finished so officially closed the meeting but said if you want to go please do but also if you don’t think God has finished with you or you just want to continue to enjoy the wonderful presence of God filling this room please feel free to stay. No one moved or looked to see if anyone else was going they were so lost in God. During this time four came to tears and at one point I had one boy crying on each shoulder as they just wept out their release and I emerged with two very wet shoulders. They began to drift away until just one boy was left and he I knew was battling but it was not yet his time. When finally he got up to go I had to assist him to his feet and his friend helped him out. It wasn’t only the children who felt the Holy Spirit, I continued to tingle all over and I couldn’t get a straight conversation out of my interpreter for several hours. The final seminar was the cream on the cake, the three extra boys who were added were ministered to in the areas they had missed from the first day so I had all the other boys lay hands on them and pray for them. I saw the faces of the three change before my eyes and when the prayers finished I saw their faces were ecstatic. I believe in moving in and training up quickly. Those who prayed had been set free days before, now they were praying for others as I did for them and God was answering. The final day was the day for the boy who had left the meeting last previously. God gave me a word for him as him being like a shaken up bottle of Pepsi wanting to explode in God but he wouldn’t take the top off because he was afraid. He had hidden things deep inside and would never tell anyone because it was too embarrassing for him. He immediately said true to that and to my other question that you know exactly what the problem is. I could then tell him that God had told me what it is and my love for him was just as great as before I knew this and no one would ever be told his secret. He beamed and we were able to minister to him through his tears at one point. Later he told me with radiant face that his heart felt free and later that evening he told me his heart felt lighter now. We concluded by everyone instantly speaking in tongues with three beginning to speak before I had finished praying for them. I have found in India that the girls are always the hardest ones to get to speak in tongues but not those in this group. To conclude India I have to share one more very important thing, while in Chennai en-route for Uganda I woke that morning with a heavy burden for the children who had been in the rejection seminars. I felt I had missed something important, then after meditating and waiting on God I felt that I had covered the rejection side but not the pain it brings with it. Some of that group by the time I return next August could well have had to leave the orphanage to go to college and no way can I make a full length visit before then. As I continued meditating and got into my daily devotions that very morning’s scripture readings were the following. Hebrews 11, it was by faith those heroes did the impossible. (To return was impossible) Acts 20 v 22, I was bound by the spirit to go… Acts 20 v 24, my life is worth nothing unless I use it for finishing the work God gave me to do…. Acts 20 v 28….feed and shepherd God’s flock purchased with His own blood…. To me it is clear I have to go back, it would just be for a few days tagged onto another trip, please let me know any comments or feelings you have reading this, bless you. Onwards to Uganda and the amazing time continued and grew beyond all I could imagine. This was my fourth visit to Uganda after a fifteen year gap and the long-time goal of my missionary friend there and I, for these visits has been to set up a model for all to see of all that God can do in and through children. This time God excelled as He gave us four first time ever events which I have never seen in my many past visits to African countries. 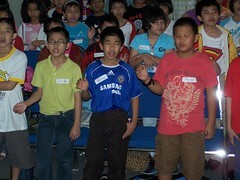 Number one, was to have a two and a half day children’s residential camp in my host church. We had sixty eight children and young teens and they so loved it you would think you had taken them to some expensive holiday resort as they had never been away from their own huts before. They were so open and hungry for everything spiritual and received it, we had a number of times of revelling in the awesome presence of God and Godly silences where everyone and thing was quieter than quiet which in a country which has noise of some kind twenty four seven has to be God. My ministry team of children excelled in a new and powerful anointing as they got involved in more ministry. Number two, taking nine of the ministry team away to a town four hours’ drive away to lead a children’s two day non-residential camp, (we could only take some of the team because of transport problems). You would think you had flown them to Disneyland they were so excited. These children had never left their own village before, one boy testified back home in the church. “I had heard about Tororo in school but didn’t know where it was and now I have been there and it was wonderful”. The team was accommodated in a boarding school as it was school holidays and I was taken to see they were settled in okay and as I arrived two boys grabbed my hands and excitedly took me round to see everything including the toilets as they are only used to a hole in the ground behind a bush. The highlight for them was for the first time in their lives to sleep not only on a bed but a top bunk and a soft mattress as they usually sleep on a blanket on the hard floor. This is only a portion of the things that excited them and my heart bled, that the few measly pounds it cost to give them this cannot be counted in its worth because it brought so much joy and excitement to their lives. I see it as God giving back exceedingly abundantly to them for their service to Him. They did a lot of the ministry there including leading praise and worship, leading children to salvation, the Holy Spirit, speaking in tongues and continued to lead them in worshipping in tongues in following meetings. Number three, the day before the end of my trip I had the privilege of baptising forty children in water. The miracle of this is that bush Africans are scared of getting into water and many needed extra assurance as they got in and one little girl was petrified and shaking as I took her but no way was she willing to get out until she was baptised. Number four, I found that one of my ministry team, a fourteen year old boy, (who I have known from my first visit has a call to full time ministry and we have been building together) now he has fairly good English so I asked him to begin interpreting for me. He responded with a huge smile and excited yes and so we began. I put my hand on him one side and my regular interpreter on the other for reassurance and he was like a steam engine gathering steam, he was off. The first time my interpreter prompted him quite a few times but from there it got less and less until my final meeting he did his longest stint of interpreting with only an odd correction. So what can I say, wow, amazing, brilliant a fantastic time beyond all I could ask or think. Also a huge thank you to you for being such a big part of praying so that God could make all the above happen. More than ever before it was not me but you and I together playing our parts so that God could most certainly do what we couldn’t to produce the fruit I have shared, and all I haven’t room to share. I can never thank you enough and words certainly can’t tell what I feel in my heart. Thank you all so very, very much from the bottom of my heart.